In our final Foundation Fundamentals series, we’re talking about a foundation that is most commonly known to homeowners as a Pier and Beam foundation. We call it a Crawl-Space Foundation and use it most often when clients are in a floodplain and require an elevated home. **For those of you who live in a floodplain (hello to our friends in Meyerland + Bellaire!) you need a Crawl-Space Foundation. 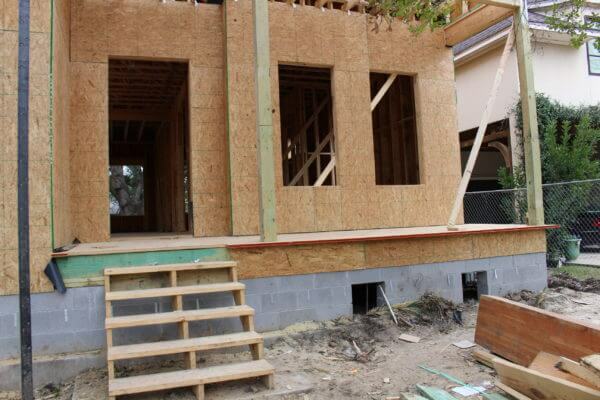 This is a typical pier and beam foundation, which elevates the home leaving a crawl-space underneath. The space between the ground and the first floor can be as short as one-two feet or as tall as an entire story. When constructing a crawl-space foundation, the first step is to drill piers and an exterior footing outlining the home. After your concrete footing is finished, a wall is built from the footing to the first-floor elevation height using CMUs, concrete masonry units that resemble cinderblocks. When building the CMU wall, we create leave-outs, rectangle holes allowing air to flow through for ventilation as well as water flow, if necessary, and the CMUs are later covered with your exterior façade material. Pressure treated wood beams attach to the piers to support the home and your subflooring is laid over the beams. Pro: Similar to a Structural Slab with Builders Piers, the foundation stability is less threatened by soil shifts over time. Additionally, the house is protected from rising water and you have easier access to your plumbing. Con: With a crawl space comes additional drainage needs to prevent standing water that can cause mold problems. We pour your driveway and sidewalks later, so they don’t get beat up during the rest of the construction process. Catch up on everything you need to know about Structural Slab with Builders Piers and Post Tension Slabs in Part 1 and 2. Have questions about foundations? Give us a call! And stay tuned for more Building Science Breakdowns.